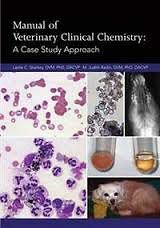  A practical resource for improving skills of clinical chemistry interpretation and clinical reasoning.  125 ilustrated case studies emaphasizing differentiaion of diseases with similar laboratory findings.  Ancillary hematology, cytology, urinalysis, coagulation and radiographic findins are integrated with the case studies as appropriate.  Each case contains an Interpretation Section where all abnormal findings are reviewed and a Summary Section where abnormalities are integrated leading to a final diagnosis and recommendations for further testing;.  All cases involve real patients with real findings in dogs, cats, horses, ferrets, llamas and pot bellied pigs.